Gretchen Gobin, The Congressional Schools of V.A. 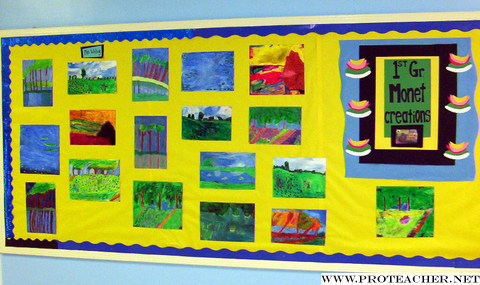 This Bulletin Board showcases the Spring Season in Monet's visionary paintings of his garden and fields. The lesson included studying Monet and his love of nature and color in order to better copy his style and techniques. (The first graders were shocked and excited to hear that he was one of the first artists to paint outside!) They also learned how different his style was compared with that which was popular at the time. After examining various paintings by Monet in order to see how he used brush strokes and thick paint, the children used pencils to sketch the main shapes and forms. They used oil pastels to layer color while blending and mixing to mimic the effects made with brush strokes. As we worked, the class continued the discussion about seasons and how the sunlight is stronger and appears differently as the seasons change. We spoke about how light reflects on water, ice and snow and how it appears to warm the ground in the spring season. We discussed how Monet's use of reds, oranges and yellows invoke this sense of warmth. The students worked diligently to recreate the thick appearance of Monet's paint and his use of light and reflections. They did a tremendous job evoking the seasonal characteristics of spring by using various shades of green for the foliage and vibrant colors for the flowers. They duplicated the warm colors Monet used to show a rising or setting sun and the reflection of that light on the ground and water. They captured the essence of Monet's passion for nature by experimenting with colors and mixing them to achieve as close a rendering as possible. The Bulletin Board reflects their understanding of Monet's genius while clearly reflecting their own efforts and abilities to mimic and interpret.